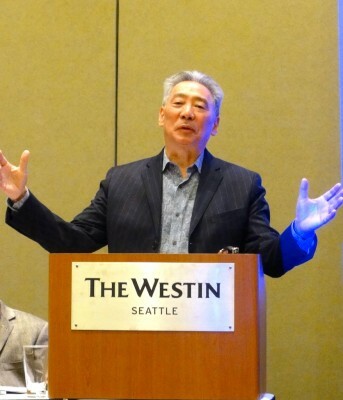 ChangeLab hosted two complimentary sessions at the recent Association of Asian American Studies Conference in Seattle and both were highly successful. It’s encouraging and inspiring that there are so many people in the academy that care deeply about racial justice and are genuinely interested in what folks in the community are saying. Many of the same questions that were raised in our sessions were echoed throughout the conference. Many scholars are examining the role of Asian American Studies in identity formation, the tie to the community, and how the Asian American movement is centered, where it came from, and where it is going. Our first session, chaired by Daniel HoSang with Michael Omi as the discussant, focused on our report, Left or Right of the Color Line. In the context of our research as outlined by senior ChangeLab partner Soya Jung, they offered important insights on the current state of Asian America. Michael Omi asked us to ponder what the racial stratification of the future will be and went on to say “the emergence of a majority minority does not diminish white supremacy.” Dr. Omi made another point that reflects the findings in our report: there is no clear Asian American politic. Daniel HoSang called on Asian American studies to examine many of the additional issues raised in our report, such as the role of Asian American studies in the loss and formation of political identity. At our second session, we hosted a roundtable of Asian American leaders to discuss the role of Asian Americans in the racial justice movement. We were incredibly lucky to have panelists Joseph Santos-Lyons of APANO, Monami Maulik of DRUM, Lisa Hasegawa of National CAPACD, Helena Wong of CAAAV, Tammy Bang Luu of The Strategy Center, and moderator Subhash Kateel of Let’s Talk About It! Radio gather together to tackle the complex factors that make up the Asian American community as currently defined. One attendee mirrored Daniel HoSang’s comment from the previous day when she raised a concern about how the centering of the community is no longer de rigueur in Asian American studies. Others asked important and challenging questions around how we define racial justice and what that means to us, how we scale up our organizing and messaging, and how imperialism relates to our experiences as Asian Americans. Thank you to all of the roundtable participants for a stimulating discussion, Michaela Omi and Daniel HoSang for their thoughtful commentary, and a huge thanks to all the conference participants who came to our sessions and dialogued with us!